It is fifty six years to the day when Dr Richard Beeching’s report “The Reshaping of British Railways” was officially published on the 27th March 1963. This is a sneaky repeat post from six years ago on the fiftieth anniversary, buts its still spoken about, with many opinions to this to this day, so my thoughts below are still relevant. Beeching was at the time Chairman of the British Railways Board. The report identified 2,363 stations and 5,000 miles of railway line for closure, 55% of stations and 30% of route miles, with an objective of stemming the large losses being incurred during a period of increasing competition from road transport (that also had the support from the then Minister of Transport Ernest Marples whom it appears had connections to the road construction industry and had also appointed Dr Beeching in the first place). Many of the ex Southern Lines especially in the South West of England, already coined the ‘Withered Arm’ were closed as a result of the report. A few protests resulted in the saving of some stations and lines, but the majority were closed as planned and Beeching’s name is to this day associated with the mass closure or ‘axe’ of railways and the loss of many local services in the period that followed. One such line that was included in the report for closure was the Tamar Valley line, however due to the poor road links in the area some of the line was reprieved and survives to this day between Plymouth, Bere Alston and Gunnislake. In fact there is currently a growing movement and support for the line to be reopened north of Bere Alston back to the south end of Tavistock. In addition to the main report there were a number of maps included within Part 2 of the report that diagrammatically showed data such as : Density of passenger traffic, Distribution of passenger receipts, Density of Freight Traffic, etc. and of course the main outcome of the report the map of Proposed Withdrawal of Passenger Services. I have reproduced part of a couple of these maps in this post showing the Southern Region area. Map 9 Proposed Withdrawal of Passenger Services shows the almost total eradication of the ex Southern Railway lines in the South West as already mentioned above, and a number of other lines in the South of England identified for closure. Happily some of these lines have now since reopened as preserved railways such as the Alton to Winchester line that between Alton and Alresford now forms the Mid Hants Watercress line. 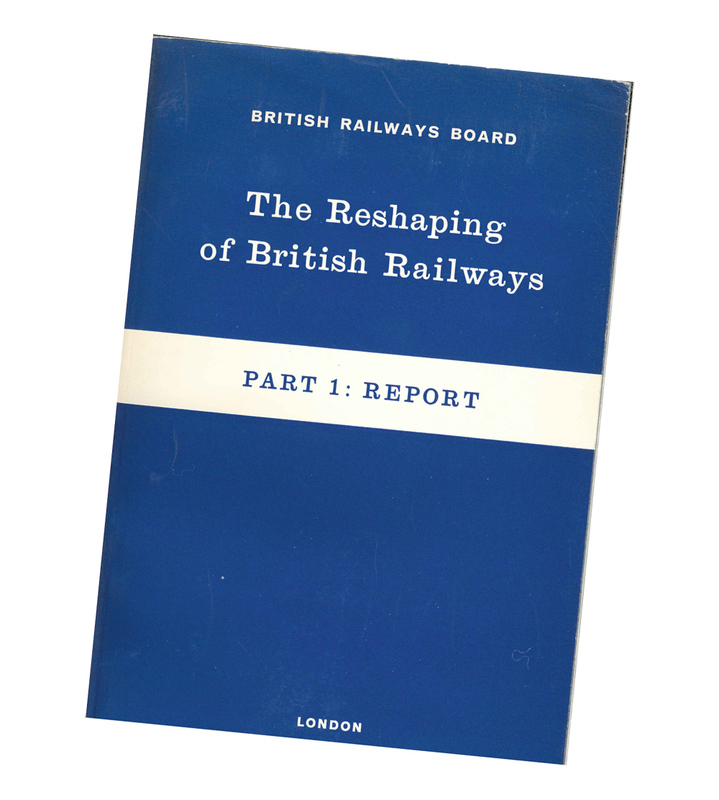 Although the Unions at the time released their own version of the report titled “The Mis-shaping of British Railways” a number of facts (although in some cases the basis of collection of some of these facts have been questioned) within the report appear compelling and it is perhaps not surprising that the conclusions reached were so wide ranging. The report with respect to freight on the railways proposed the move to quicker, higher capacity trains, serving the main routes, transporting greater loads to hubs. Not with the then traditional wagons but trains loaded with containers. Does that seem familiar today? Whilst Beeching is a much maligned name for the passenger line closure section of the report it is easy perhaps forget that this report dramatically modernised freight on the rail network promoting containerisation and long-distance freight haulage. It is fifty years to the day when Dr Richard Beeching’s report “The Reshaping of British Railways” was officially published on the 27th March 1963. Beeching was at the time Chairman of the British Railways Board. The report identified 2,363 stations and 5,000 miles of railway line for closure, 55% of stations and 30% of route miles, with an objective of stemming the large losses being incurred during a period of increasing competition from road transport (that also had the support from the then Minister of Transport Ernest Marples whom it appears had connections to the road construction industry and had also appointed Dr Beeching in the first place). Map 9 Proposed Withdrawal of Passenger Services shows the almost total eradication of the ex Southern Railway lines in the South West as already mentioned above, and a number of other lines in the South of England identified for closure. Happily some of these lines have now since reopened as preserved railways such as: the East Grinstead to Lewis line, now the Bluebell Railway recently successfully extended to reach back to East Grinstead from Sheffield Park. Also the Alton to Winchester line that between Alton and Alresford now forms the Mid Hants Watercress line.